After our jaunt to Devil's Tower and Prairie Dog town, we made our way to South Dakota. Mt. Rushmore is one of the sites I've wanted to see since I was a kid, from looking at encyclopedias and from the Alfred Hitchcock film "North by Northwest." More recently, my interest was piqued by "National Treasure: Book of Secrets," though I'm pretty sure that there is no city of gold buried beneath it. We arrived in mid-afternoon in Keystone, South Dakota, which is sort of a cowboy-presidential themepark of a town. We checked into Rushmore Express, a comfortable motel about two miles from Mt. Rushmore. After a big meat extravaganza dinner at the Powder House Lodge, we made our way to the historic site. 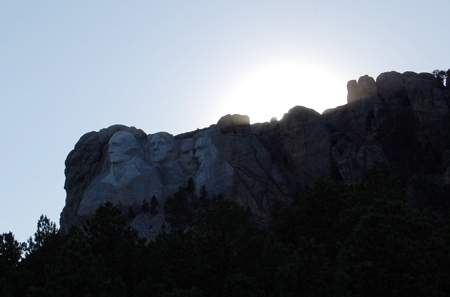 On the road up to the entrance, you can see the giant presidential head carvings after you turn a certain bend. It reminded me of seeing the Pyramids in Egypt looming over the horizon, like something incongruous and out of place in the surrounding woods. The sun was starting to hang low in the horizon. We parked the car in the multi-level parking structure and headed up to the visitors center. 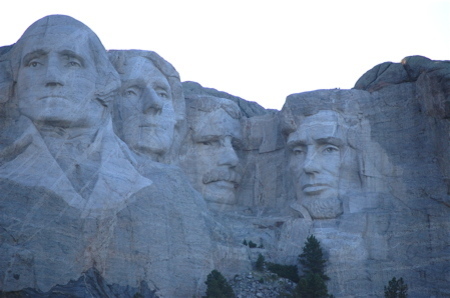 The giant heats of the four presidents--Washington, Jefferson, Roosevelt, and Lincoln--loomed above the granite mini-mall of gift shops, visitor information centers, and restaurants. You walk through two rows of stone pillars featuring the flags of the fifty states to get to the prime viewing platform. Below that is a large amphitheatre with a stage at the base of the mountain. We arrived just in time for the Evening Lighting Ceremony, which featured a young woman in a park ranger outfit named Summer leading the crowd in a game of presidential trivia. Her long, wavy, strawberry blonde hair flowed out from under her Smokey the Bear hat, and she seemed sweet. After the trivia game, she showed a file about the President's featured on Mt. Rushmore. After that, she told the story of the writing of the "Star Spangled Banner", reciting the first three verses from memory, and then singing the familiar stanza in a high, operatic voice. I wasn't sure if I was at a national park or a Miss Teen Park Ranger pageant at this point. She seemed sweet and earnest, and really seemed to enjoy her job as Ranger bunny. The MOMocrats have received credentials to cover the Democratic National Convention in August, and need some help getting there. Please make a donation by clicking on the Chip In button above, to help us defray the costs of travel and housing while we are in Denver! For $25 or more, we'll send you a MOMocrats bumpersticker and our undying gratitude!